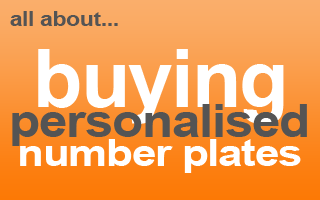 Use the SEARCH box (above) to find your perfect personalised number plate. There are literally millions of personalised number plates to choose from. So take your time to choose the right one before you buy. You can look for anything you like. Most people opt for their name or initials. But you could just wasily look for some thing connected with a job, hobby, or a nickname. Anything you like. That's why they are personalised number plates - unique to you. How do I buy a personalised number plate? Buying number plates is pretty straightforward. All you have to do is choose the one you want. And we'll take care of the rest. The biggest factor is your budget. How much do yo want to spend on a personalised number plate? This will affect your choices. You can go for your name, initials, hobby... pretty much anything that takes your fancy. The only thing you need to bear in mind is the age of your vehicle. You can't make a car appear newer than it is. If you're not sure, take a look at our list of car registration dates to check if the registration number you're looking at is suitable for your vehicle. Even though it's a personalised number plate, the DVLA will not allow you to transfer the registration number to your car if it's too old. But all is not lost! In most cases you can hold your personalised number plate on a Certificate for up to 10 years, to use it in the future. What happens when I buy? How does it work? When you buy a personalised number plate, that's the first step. The next step is to assign it to the vehicle that you have in mind. It doesn't have to be your own car. Many people buy them as a gift for someone else. In most cases we can either send you on a Certificate for you to use at a later date. Or we can re-register your vehicle for you with the DVLA. What do you need from me when I buy a personalised plate? When you buy, we will ask you for some basic information. Usually we need to know the name of the Registered Keeper of the vehicle you plan to put the number plate on. That's to ensure we secure it in the correct name. This may not be your name, especially if you are giving this as a gift to someone. Paperwork is sent to the person who purchased the registration number, not the Registered Keeper of the vehicle (if that's different). If we assign the registration number for you though, then the DVLA will send a replacement V5C Registration Document to the owner of the vehicle. What if I don't want to put it on a car straightaway? When you buy a personalised number plate, that's the first step. The next step is to assign it to the vehicle that you have in mind. In most cases we can send you on a Certificate for you to use at a later date. This may not be the case for all registration numbers though, so please ask us first if this is important to you. Sometimes it's still possible to do, but there may be extra costs involved. Got more number plate questions?